Last year’s Moana party was so easy to plan. My daughter threw me a curve ball this year. 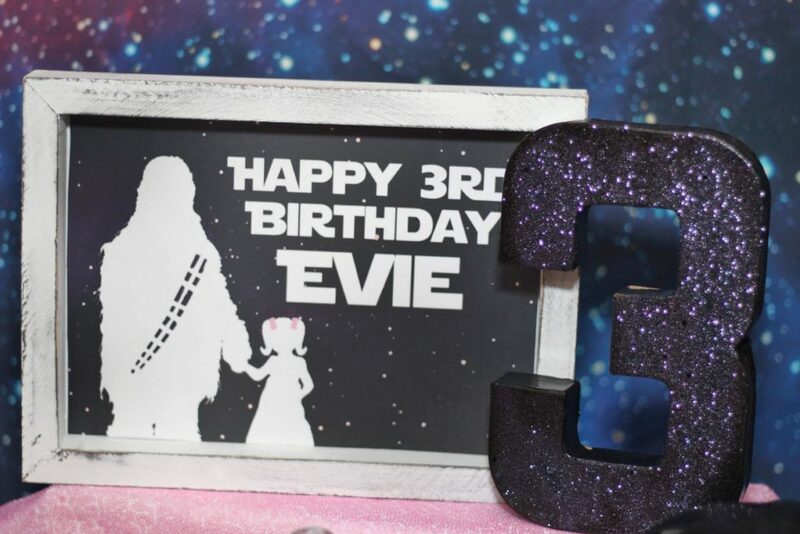 For the past three months she said she wanted a ‘Chewbacca’ birthday party. 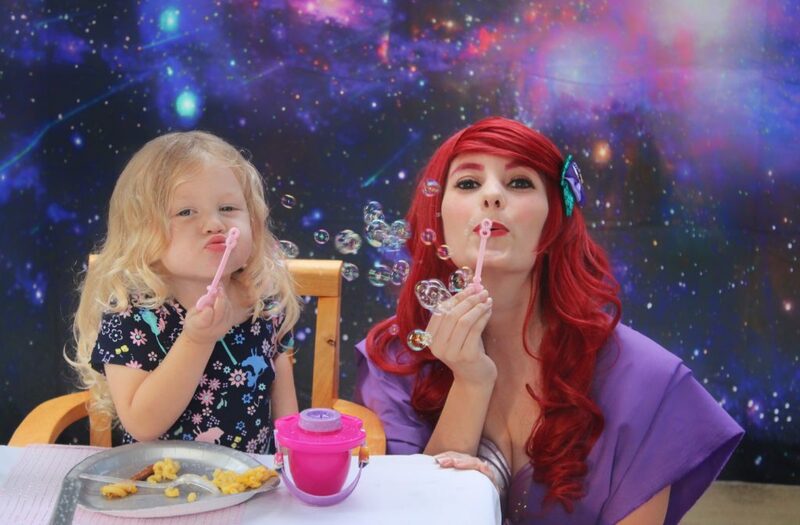 A few weeks ago, while shopping and preparing for it, she said she also wanted Ariel, and Belle, and Rapunzel. How was I going to pull that off? 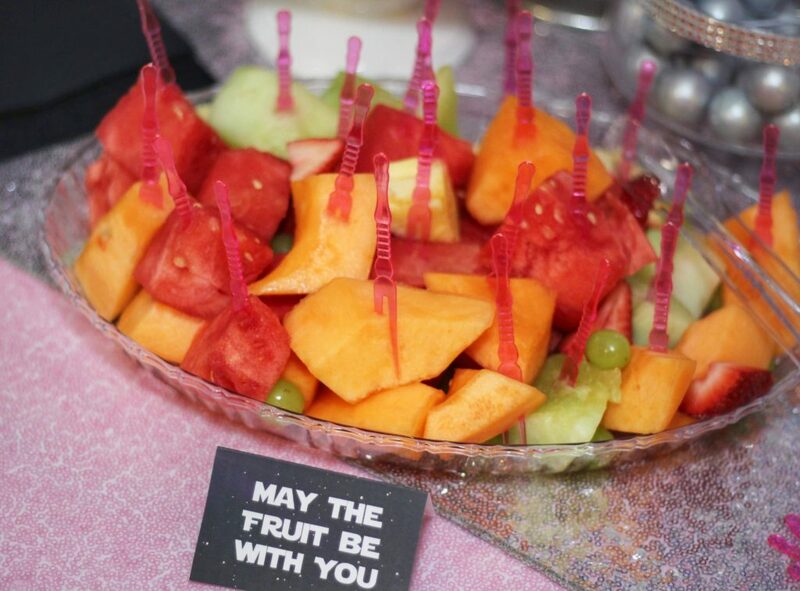 I scoured Pinterest but couldn’t find many ‘Star Wars meets Disney Princess’ party ideas. So here’s my take on the combination. 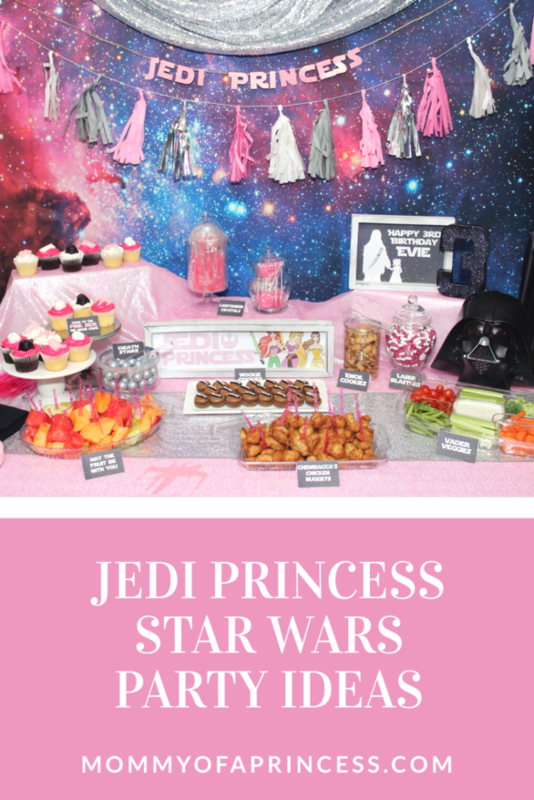 I’m sharing my girly Star Wars Party ideas plus a few free printables in case your daughter wants the same theme. 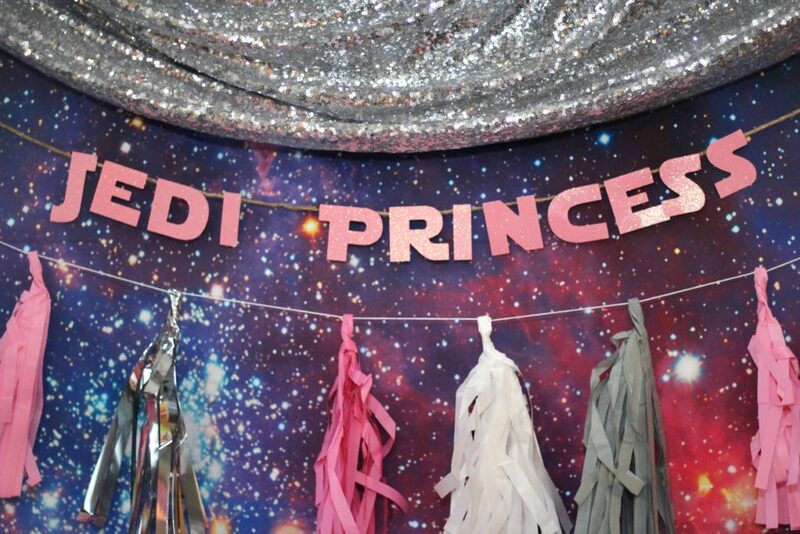 We went with the concept of Jedi Princess. I made sure everything was pink and sparkly just like my daughter loves. My mom ordered two fantastic space backdrops from Amazon and they were STUNNING! This one was behind the food table, and this one was outside for photos. The bright colors really stood out and made the whole set up pop. I tried my best to incorporate both the Star Wars space element and her favorite Disney Princesses. 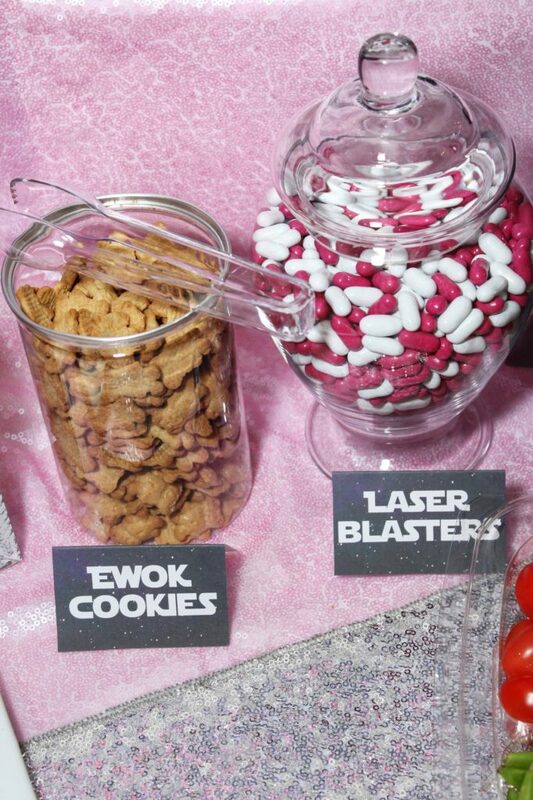 With Chewbacca being my daughter’s FAVORITE Star Wars character, I tried to incorporate Chewy into several food items. 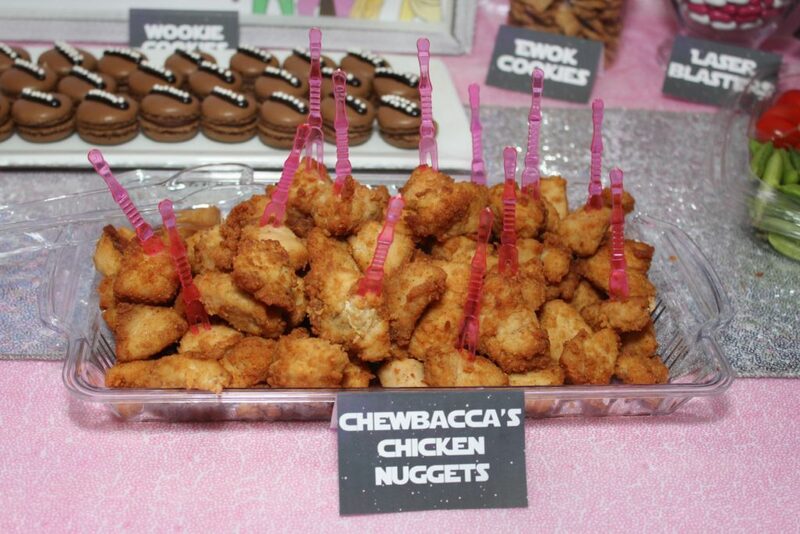 We had Chewbacca Chicken Nuggets (read more about our love for Chick-fil-A here). 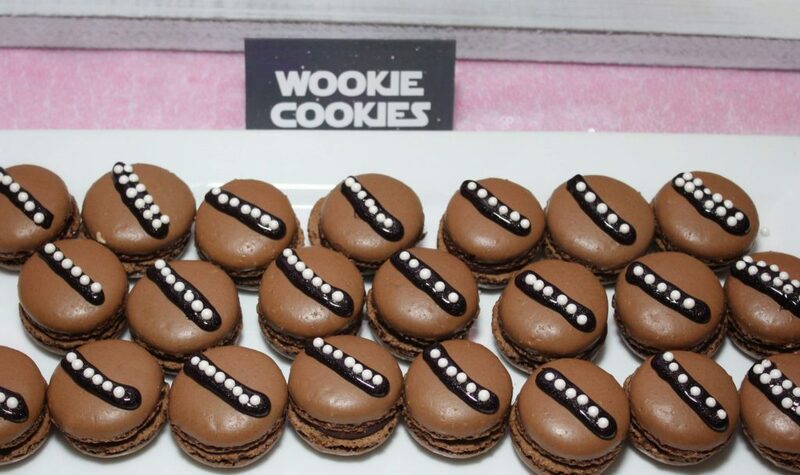 I also made ‘Wookie Cookies’ which were chocolate macaroons from Trader Joe’s with black icing and little pearls to make his sash. 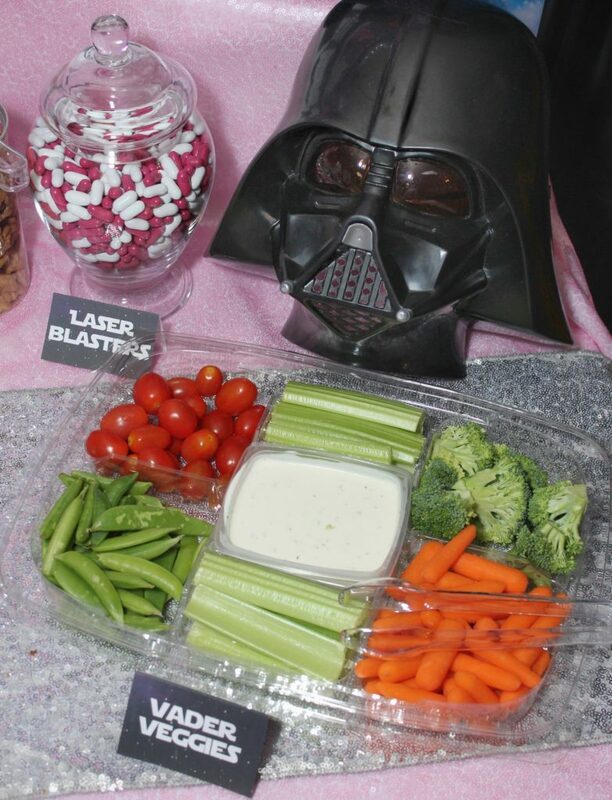 We also had ‘May the Fruit Be With You’ and ‘Vader Veggies’ for healthier options. 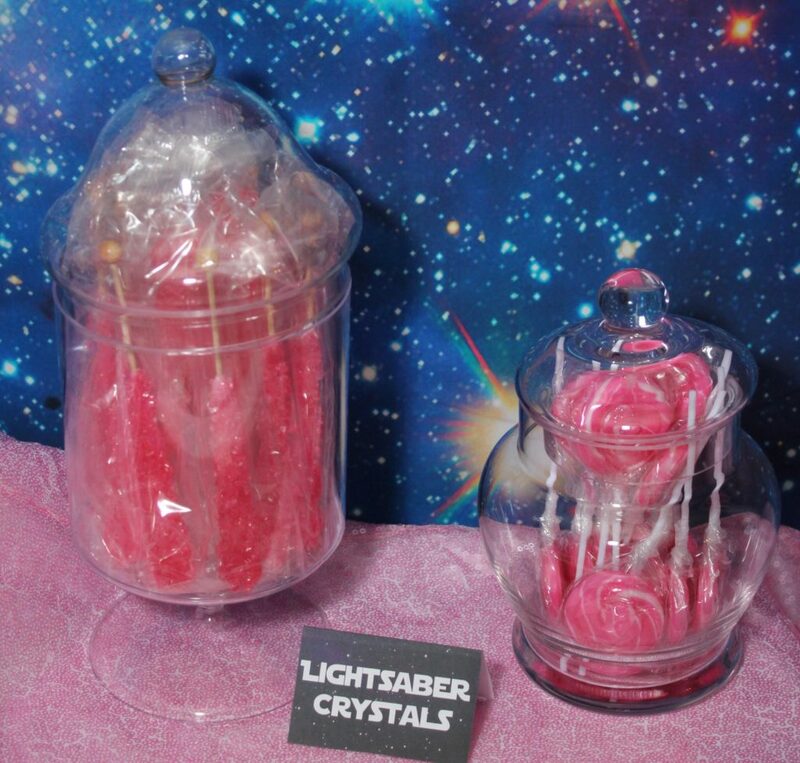 For treats, my daughter choose a few of her favorites: Ewok Cookies (Teddy Grahams), Laser Pellets (Good and Plenty), Lightsaber Crystals (rock candy), and just plain pink lollipops because she wanted them. For the cupcakes, I ordered plain chocolate and vanilla cupcakes from my local Publix bakery and requested half with white frosting and half with pink frosting. I ordered these silicone molds from Amazon and purchased melting chocolate in different colors. I made the chocolate toppers a week in advanced and kept them in the fridge until the day of the party. 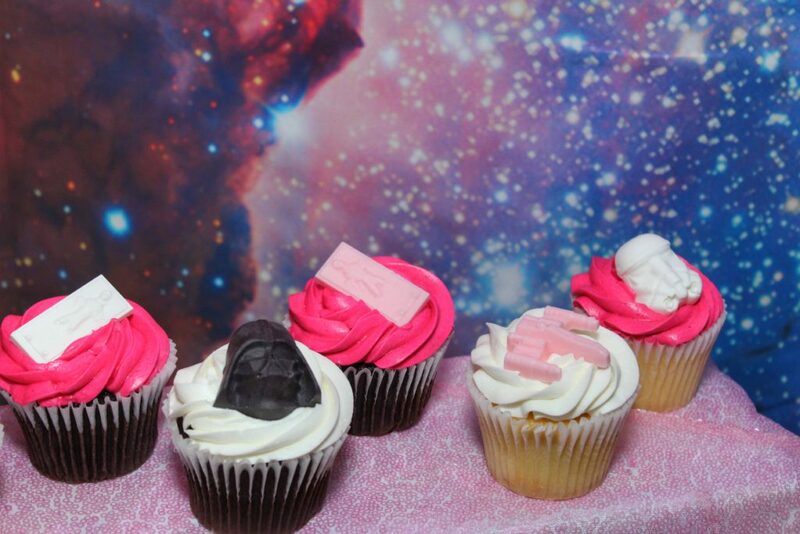 They were a huge hit, looked awesome and didn’t cost very much. Unfortunately, it rained during her party so we didn’t get to do all of the activities. My daughter specifically wanted a make-up and nail station. I let her choose make-up, brushes, lip gloss and nail polishes from the Dollar Tree. She also chose Princess and Star Wars tattoos (from Party City) and coloring books. I made a sign that said ‘Choose Your Side’ in Star Wars font, but the rain ruined it. 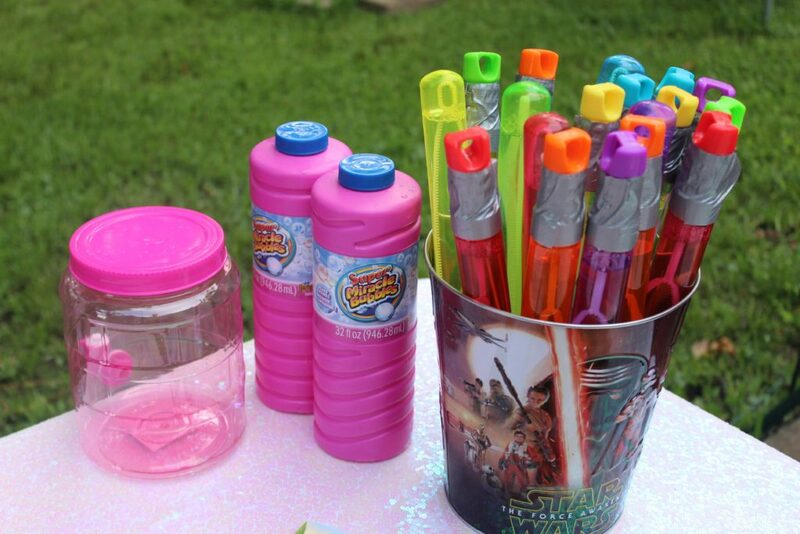 Lastly, we had bubble wands aka lightsabers. We put duct tape around the handle and then had rolls of tape for guests to design their own lightsaber. We had a bubble refill station as well and this kept most of the kids busy during the party. 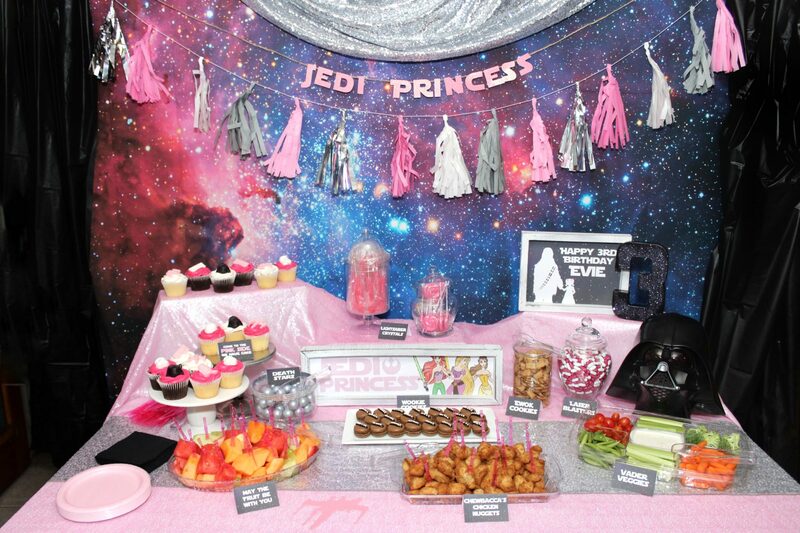 A girly Star Wars party isn’t complete without a few surprises. My daughter LOVES meeting characters at Walt Disney World so I wanted to bring some of that magic to her party. 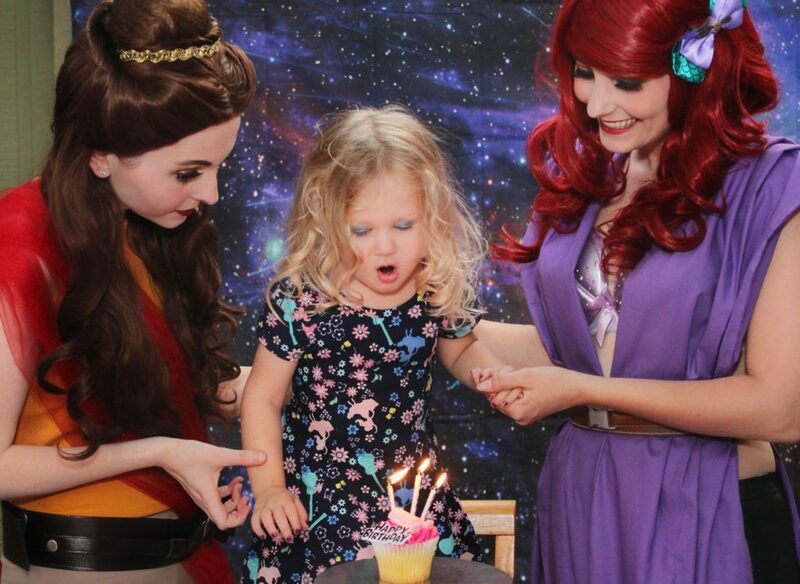 I had a couple of friends dress up as Ariel and Belle Jedi. 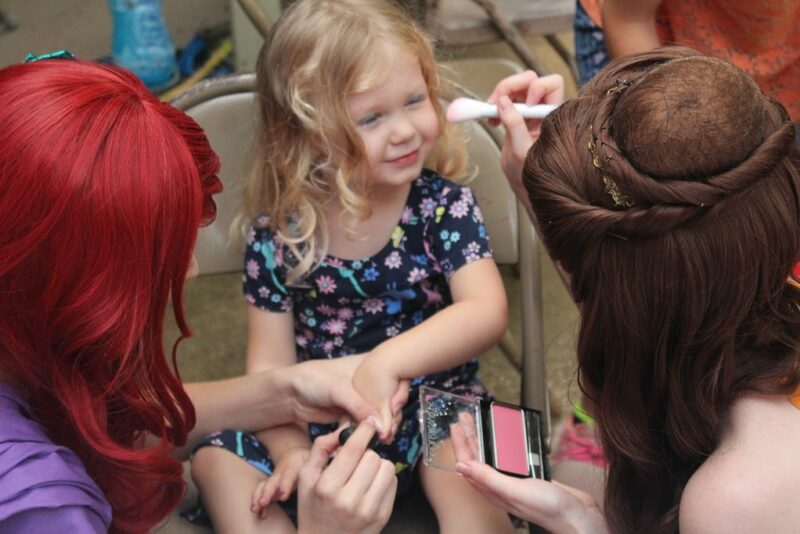 The crossover outfits were so cute and my daughter loved spending time with them during her party. The best surprise was when Chewbacca showed up. We purchased this costume on Amazon and my brother volunteered to dress up for part of the party. Of course, everyone wanted to take pictures. It was especially memorable for Princess Evie though. 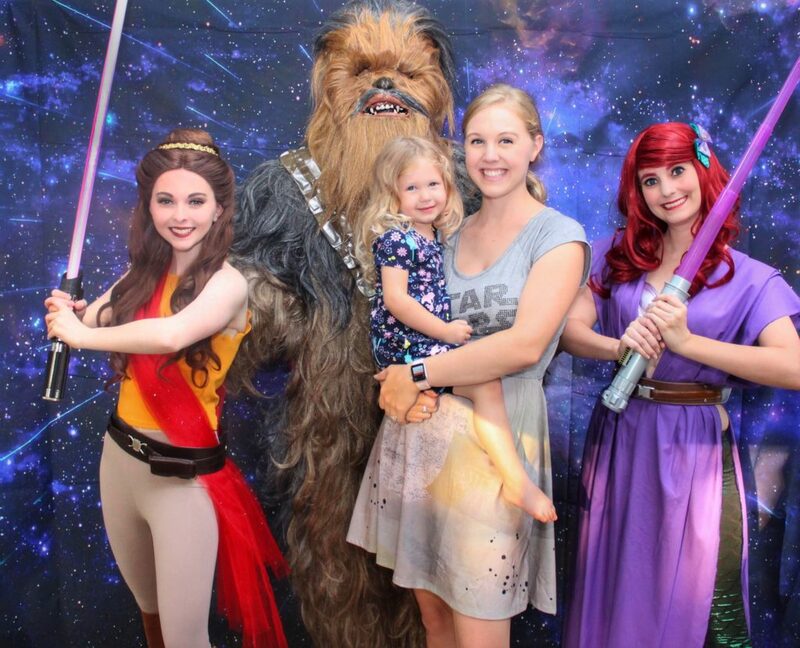 And yes, she is definitely wearing an Elena of Avalor dress because the Chewbacca tutu she was SO excited about just hours before the party wasn’t what she wanted to wear when it started. I guess since she’s a #threenager I should expect that more often, but that’s a completely different post. 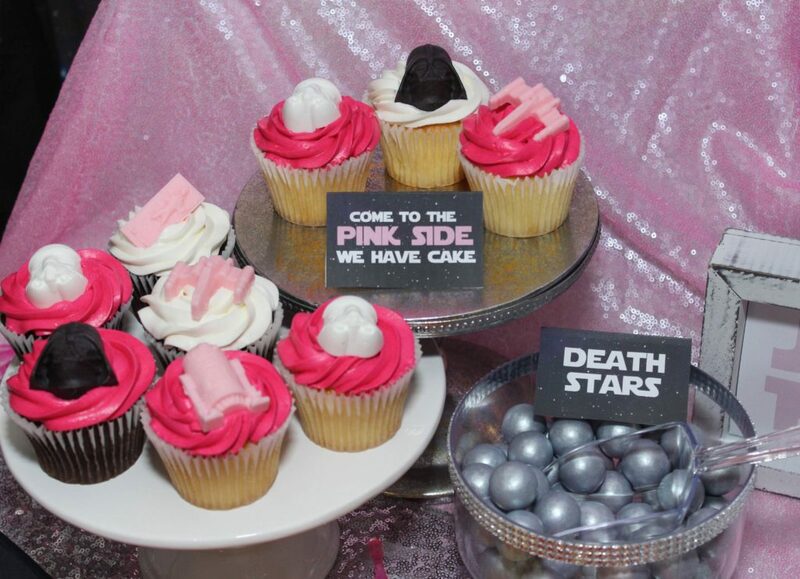 If you’re planning a girly Star Wars party, I hope these ideas are helpful! Join my Facebook VIP group to access the complete set of FREE printables below. Answer the questions and once approved, you’ll be granted access. Click on “files” to see all free printables or check out the pinned post. 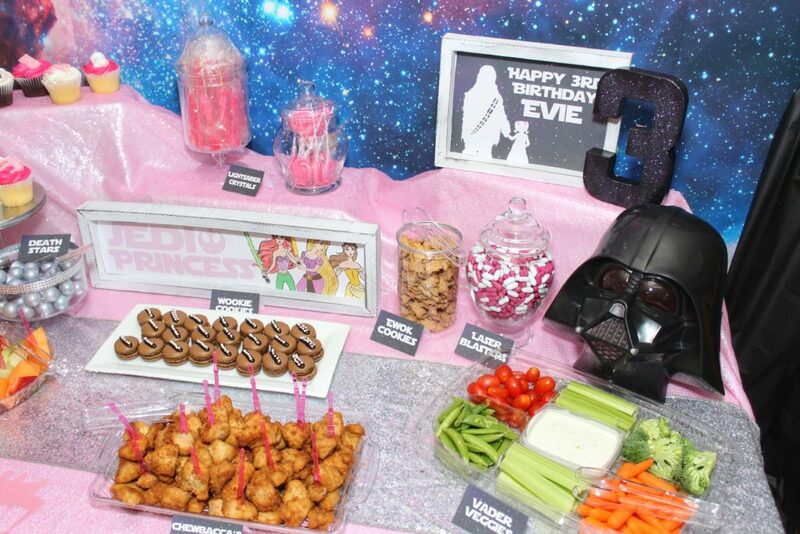 Food Cards Including: Chewbacca Chicken Nuggets, Death Stars, Come to the Pink Side we Have Cake, May the Fruit Be With You, Vader Veggie, Palawan Pizza, Yoda Soda, Luke Sky-Water, Lightsaber Crystals, Laser Pellets, and Ewoks.